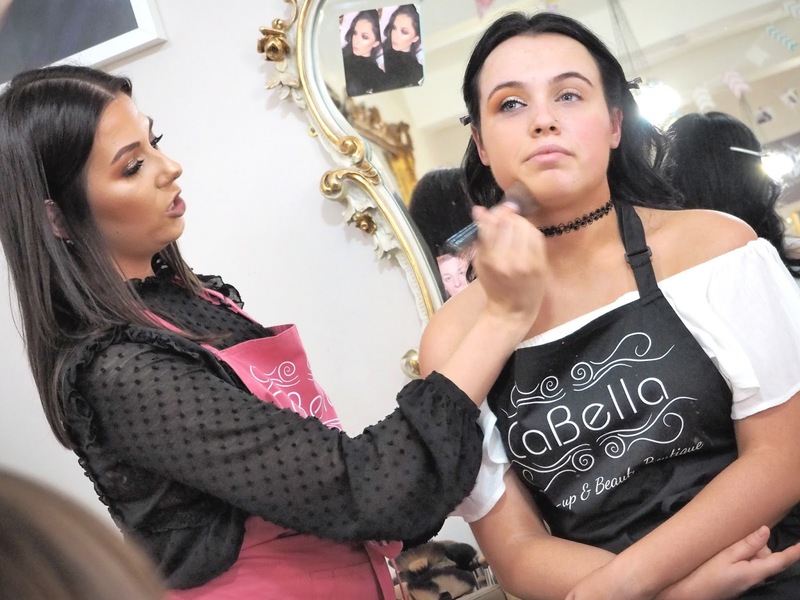 Now you may have recalled a previous visit I had at the beautiful Make-up boutique within Nottingham; CaBella is in the heart of the city center, just a stroll up Bridlesmith walk, and it's a perfect place to go to if you're looking for make-up tips and tricks, needing your make-up to be applied for a special occasion, or just a treat for you and the girls! 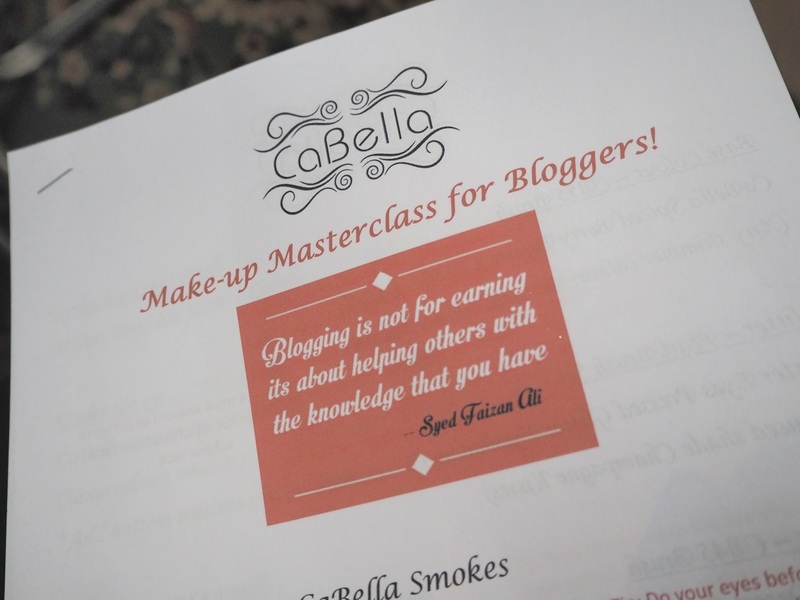 When my friend, Sarah, notified me about the CaBella ladies putting together a blogger's evening, I was more than excited to inquire about attending. As a lot of you may know, my biggest passion is make-up, and growing up I always wanted to become a make-up artist. Over the years my obsession with palettes, lipsticks and much more has grown and I'm keen on learning something new, so I'd love to share my experience with you all at this informative event. Upon my arrival, I was greeted by the talented team that are Dannica, Jordan and Charlie; three individuals which all live and breathe glamour and passion for their job. With complimentary prosecco, I made my way to the rest of the excited bloggers and took a seat; each seat was laid with detailed information about each presented look for that evening as well as generous goody-bags from CaBella and Kieh'ls, which I'll include more about them further on! The first look on one half of the face, was done by Dannica on Charlie. This was their signature smokey look, which had more of a wow impact and was ideal for long lasting wear, preferably for an evening out or for a special occasion/event. 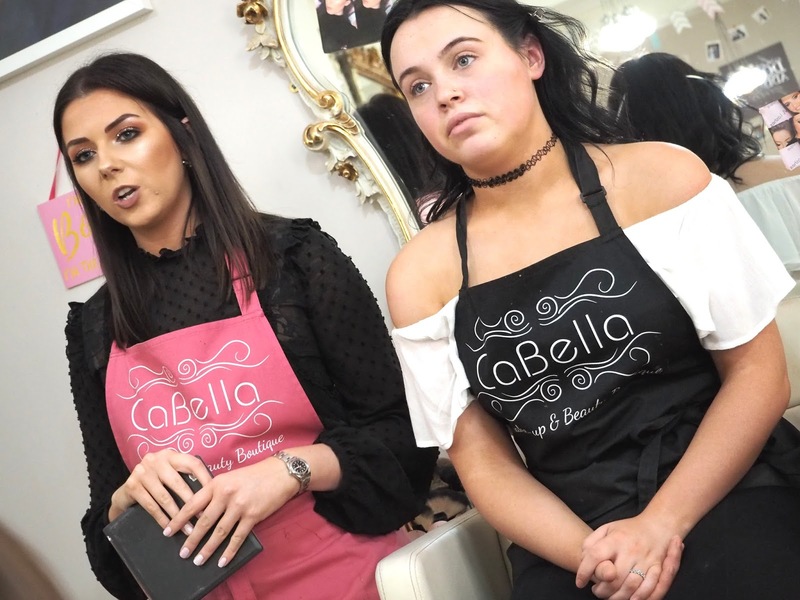 Dannica walked us through every step of the way, indicating that it's ideal to apply your eye shadow before your foundation incase of any fall out, and to start off with little application, to further build up the pigment and effect. The glitter pigment that she used was one of my key favourites, this was in the shade, Champagne kisses by Glitter Eyes. 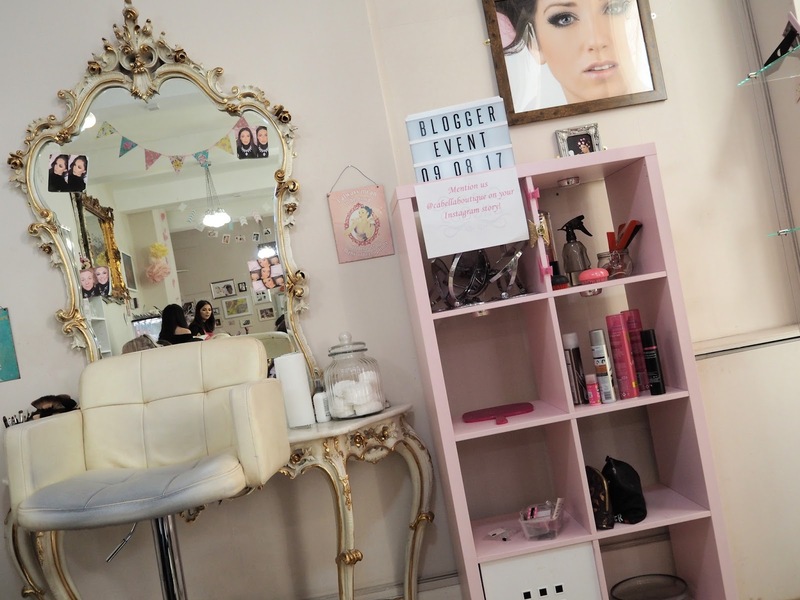 It was amazing that every product used was fully pigmented, a little went such a long way and you can see how it was well worth the money, on lasting and value. This was the completed look on Charlie; with an insight of how to contour best for your face shape, the famous selfie light picked up the best highlight and sparkle! I would love one of these beauties for my further selfies that's for sure! For the next part of the masterclass, Jordan then demonstrated a lighter application on the other side of Charlie's face. This was a look which showcased their own brand new line of pigments and eye shadow palettes. The main pigments used for this look were Sphinx and their luxurious gold in Vegas for that added pop in the eye's corner. We were then given the chance to see every new pigment swatched onto Charlie's arm and there were plenty of 'oohs' and 'ahhs' as our to-buy lists were slowly growing! This was both of the overall looks created by Dannica and Jordan, I just adore how both were so different but yet with their added CaBella flair. I had to also grab a shot of the pigmented arm Charlie was sporting for us! It was great that they were so patient in letting us take photos and ask questions where needs be. I found it an informative and fun evening, with serious girly envy of their decorated location. I'm sure I'll go by again and pick up a few make-up essentials, and apply their techniques to my own look in the future. Below is an overview of the kind goody bags given to us on the night; With information on other independent businesses, which CaBella also support. There were two samples provided by Kiehl's, which were an eye balm and the ultra facial oil free cleanser. As you know, I'm loving trying out the Kiehl's range so these will come in handy! In the CaBella goody bag, there were great discounts and offers from local businesses, a scrumptious white chocolate truffle from Studio Chocolate, some samples from Bareminerals, although the foundation shade is very dark for my skin, it was interesting to see the consistency and something I could trial out in my matched skin tone. And kindly given to us was a random selected pigment from CaBella! I was shocked to find the shade Twilight in my bag, this is a purple shade with silver reflects, and would compliment my green eyes if I went for a bold look! This is the shade Twilight in just two strokes! I will have to post an overall make-up look on my Instagram feed using this pigment, so do keep an eye out for that! A massive thank you to the ladies at CaBella, for hosting such a great evening for us all! Find out more about their masterclasses and prices especially if you're local, here.